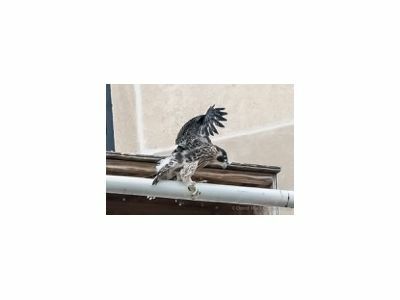 KALAMAZOO, MICH- July 7, 2015 – Fifth Third Bank announced it is officially collecting name suggestions from the community to name three of Kalamazoo’s banded Peregrine Falcon chicks today. The fourth chick will be named by a 6th grade classroom at Parchment Middle School. In early May, four chicks hatched in a nesting box on top of the Fifth Third Bank building in downtown Kalamazoo. Unlike other banded birds, Peregrine Falcons are given a name when banded. With each band number, a name is entered into a national Peregrine Falcon registry and birds are referred to by name, as well as a band number. Community members are invited to stop by any Kalamazoo area Fifth Third Bank between now and July 21 to submit a name suggestion for the three rare birds, and also share the reason for the name suggestion. Based on the submissions, a committee of community leaders will review and select the final name on July 23, followed by an announcement. Peregrine Falcons came near extinction and remained on the list of federally endangered species until 1999. The Peregrine Falcon remains on the endangered species list in Michigan. In 2014, Kalamazoo’s female Peregrine Falcon, Rebecca, successfully hatched her first egg in the nest on top of the Fifth Third Bank building in downtown Kalamazoo. Last July, the Bank asked the Kalamazoo community to submit naming suggestions to its area banking centers. A committee of community leaders reviewed the submissions and voted to name the young banded bird Promise, an entry inspired by the city’s college scholarship program, the Kalamazoo Promise. Fifth Third Bancorp is a diversified financial services company headquartered in Cincinnati, Ohio. As of March 31, 2015, the Company had $140 billion in assets and operated 15 affiliates with 1,303 full-service Banking Centers, including 101 Bank Mart® locations, most open seven days a week, inside select grocery stores and 2,637 ATMs in Ohio, Kentucky, Indiana, Michigan, Illinois, Florida, Tennessee, West Virginia, Pennsylvania, Missouri, Georgia and North Carolina. Fifth Third operates four main businesses: Commercial Banking, Branch Banking, Consumer Lending, and Investment Advisors. Fifth Third also has a 22.8% interest in Vantiv Holding, LLC. Fifth Third is among the largest money managers in the Midwest and, as of March 31, 2015, had $308 billion in assets under care, of which it managed $27 billion for individuals, corporations and not-for-profit organizations. Investor information and press releases can be viewed at www.53.com. Fifth Third’s common stock is traded on the NASDAQ® Global Select Market under the symbol "FITB." Fifth Third Bank was established in 1858. Member FDIC. Copyright © 2015Fifth Third Bank, Member FDIC, Equal Housing Lender, All Rights Reserved.